Beautifully engraved certificate from Stamps.com. This historic document was printed by the Security Columbian United States Banknote Company and has an ornate border around it with a vignette of the company's name. This item has the printed signatures of the Company’s President and Secretary. 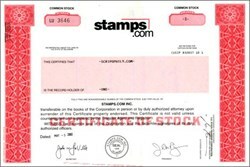 Stamps.com is a leading provider of Internet-based postage services. Stamps.com enables customers to print U.S. Postal Service-approved postage with just a PC, printer and Internet connection. The company targets its services to small businesses, home offices, and individuals, and currently has partnerships with companies including Auctionwatch, CompUSA, Earthlink, HP, Microsoft, NCR, Office Depot, PayPal and the U.S. Postal Service.